Design your own long sleeve t-shirts in our design studio, then print a single order for yourself, or a group order for a whole team, event, fundraiser, fraternity, sorority, or get-together. Custom print long sleeve shirts for use as swag or uniforms. Upload your own logos and designs, or build them here using our simple tools. We sell trusted brands like Hanes, American Apparel, Fruit of the Loom, Gildan, and Canvas. Styles include v-necks, beefy, fitted, and loose. Jersey, cotton, polyester, and moisture wicking materials are available. All your favorite short sleeve t-shirts at BlueCotton have a long sleeved counterpart. That way, if you're ordering a group of custom printed shirts, you can order matching long sleeved shirts for the cooler months of the year. 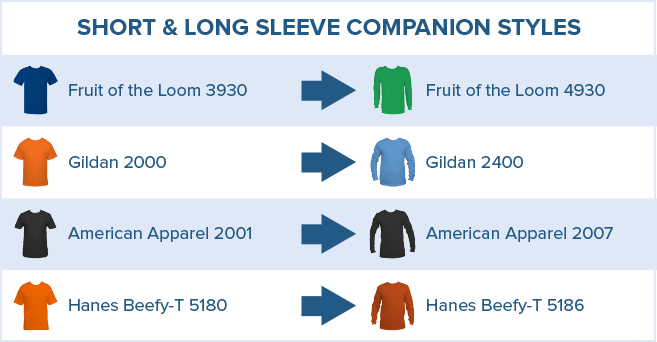 Take a look at the comparison chart below to match your favorite short sleeve shirts with their counterpart.